I have four kids that I absolutely adore, but I would be lying if I said that before, during and after my pregnancies I didn’t worry about weight. As most of us are, during our pregnancies we try hard to not gain to much weight but sometimes this is hard. This means that after we have our baby, we have the stress of trying to take the weight we gained off. I don’t know about you, but I don’t want to have to spend the time when I am with my new baby working out instead of snuggling her! I want to spend every second that I can with her in my arms and enjoying her. 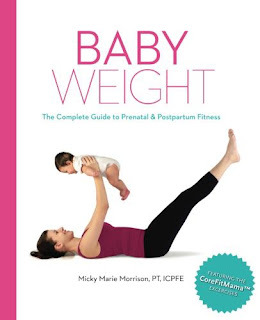 Baby Weight: Complete Guide to Prenatal & Postpartum Fitness teaches you about the progressive and intense core-focused CoreFitMama exercise program. This book gives you the tools that you need to control your weight and maintain your muscle tone during pregnancy so that it doesn’t have to be as stressful after your sweet baby comes. The thing I love about this book is that it gives you specifics that you can do to maintain your weight but they are geared towards beginners or intermediate. This means that if you are a beginner like me, you can find the help you need but if you are more advanced it is customized to those needs. Also, after time, the beginners will become intermediates so you can really use and benefit from this book for a long time. I love that the Postpartum fitness in Baby Weight isn’t telling you to go out and run ten miles. This is the last thing I want to do when I have a new baby. In this book you are given specific exercises that you can do while you are pregnant and specific exercises that you can do with your baby after they are born. The exercises with your baby are very safe and easy to do. They help you tone while at the same time they allow you to bond with your baby. I had a c-section with all four of my kids which meant that I couldn’t start working out as soon as I would have liked. In this book, they even give c-section variations to help everyone out. I thought this was wonderful and very useful to me. I think this Baby Weight is a great resource for soon to be and new moms to help them maintain their weight in a healthy way. Stay hydrated and stretch to help keep you healthy. This book is full of lots of great advice as well as pictures so you don’t have to worry about doing the stretches or exercises wrong. You can purchase Baby Weight The Complete Guide to Prenatal & Postpartum Fitness online at Amazon.